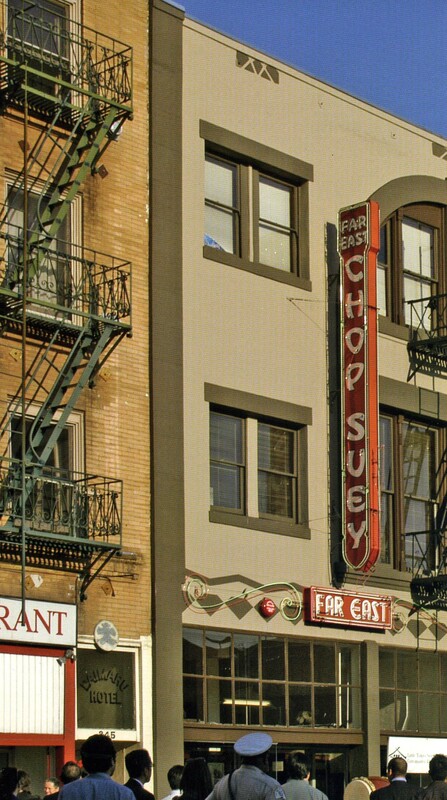 The restored 1890s Beaux-Arts Far East Building houses the historic Far East Café, which opened its doors in the 1930s. The history of Little Tokyo (population 40,000) in Los Angeles, California, began in 1885 when a Japanese seaman, Hamanosuke Shigeta, opened a restaurant on First Street. By 1900, several more businesses had been established, and the first-generation Japanese American (issei) community was booming. During this period, Little Tokyo’s population expanded as issei came to Los Angeles searching for jobs and housing. Little Tokyo was one of the first and largest Japanese American urban communities to form in the United States. During World War II, Japanese Americans living in Little Tokyo were moved into relocation camps, decimating the community. After the war, many Japanese Americans returned to a geographically smaller Little Tokyo. By the 1960s, the physical environment and the population density in and around Little Tokyo had declined drastically from what it had been in the 1920s and 1930s as a result of the rapid post-war dispersal of Japanese Americans. The later post-war years began urban renewal and opened the door to Japanese corporate capital. Although the area has gone through many changes over the last 100 years, it continues to serve as a center and symbol for the Japanese American community and history. The Japanese American National Museum in Little Tokyo is the largest museum in the country dedicated to sharing the experience of Japanese Americans. It conducts a monthly walking tour of the area for visitors. The first Buddhist Temple constructed in Los Angeles, a historic building built by Japanese immigrants in 1925, serves as the original National Museum building. Other places of interest include the restored 1890s Beaux-Arts Far East Building and the historic Far East Café, which opened its doors in the 1930s. Thirteen bronze markers throughout the area provide information about Little Tokyo’s historic resources. The James Irvine Japanese Garden is another popular tourist attraction. Each year, the community sponsors Nisei Week Festival, which was founded in 1934, and today lasts a full month. The event features a parade, traditional Japanese dancing, taiko drums, and martial arts, as well as cultural exhibits and a street arts festival.